This Wednesday, September 21 on SuicideGirls Radio, hosts Nicole Powers and Bradley Suicide will be joined by the boys from Carolla Drinks, who’ll be bringing us a case or three of their brand spanking new IPA! Head brewer Phil McDaniel of King Harbor Brewing (@KingHarborbrew ) will be on hand to guide our palettes as we experience Adam Carolla’s latest creation, Endless Rant. Plus we’ll have more of the Carolla crew on hand — Ray Oldhafer (@RayOldhafer), Chris Laxamana (@ChrisLaxamana), Patrick and Caelan – just to ensure everything goes down smoothly! ICYMI: Watch last night’s show feat. the craft beermakers behind Endless Rant and the boys from the Carolla Drinks crew here or via the player below. “I like to make a statement… and then another, and another, and another… And I don’t settle when it comes to cars, politics, music… Or BEER. So I set out to create a great brew to fuel barstool arguments and tailgate pontification. While still embracing the classic citrus notes of a West Coast IPA. A beer that makes a statement. 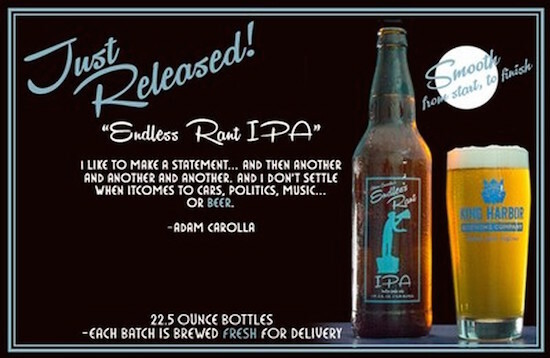 Thus, Endless Rant IPA was born.” – Adam Carolla.